Personal Finance 7 Edition For introductory Personal Finance courses. A Blueprint for Securing Your Financial Future Personal Finance: Turning Money into Wealth empowers students to successfully make and carry out a plan for their financial future. 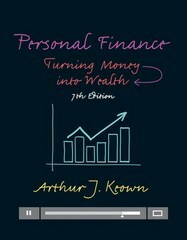 By introducing the ten fundamental principles of personal finance in a way that leaves a lasting impression, this text offers students lifelong tools that will help them effectively cope with an ever-changing financial environment. The Seventh Edition has beenupdated to reflect recent changes in the world of personal finance, including new tax laws, the recent economic downturn, weakness in the labor markets, the introduction of the Affordable Care Act, the explosion of student loans, and the rise of credit card debt. NOTE: You are purchasing a standalone product; MyFinanceLab does not come packaged with this content. If you would like to purchase both the physical text and MyFinanceLab search for 0133973425 / 9780133973426 Personal Finance: Turning Money into Wealth Plus MyFinanceLab with Pearson eText -- Access Card Package, 7/e Package consists of: 0133856437 / 9780133856439 Personal Finance: Turning Money into Wealth, 7/e 0133877728 / 9780133877724 MyFinanceLab with Pearson eText -- Access Card --for Personal Finance: Turning Money into Wealth, 7/e MyFinanceLab should only be purchased when required by an instructor.